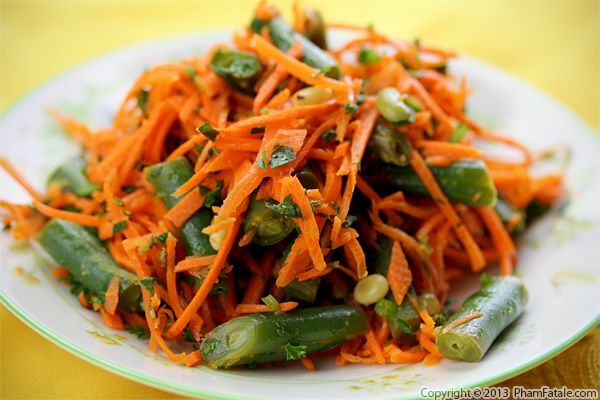 Carottes rapées are a French classic; simple crisp, shredded carrots are mixed with green beans, toasted pine nuts and Italian parsley. I drizzled lime vinaigrette over the slaw-like salad and mixed until evenly distributed. If you look at the condiments in a traditional banh mi (Vietnamese sandwich), you'll find another version of shredded carrots called đô chua. 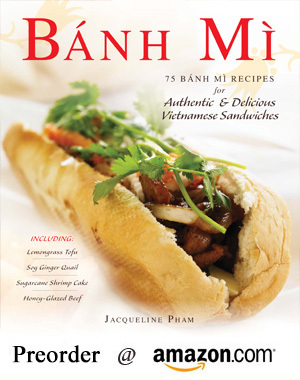 The recipe for đô chua is in my new cookbook, Banh Mi, available from Amazon and Barnes & Noble. 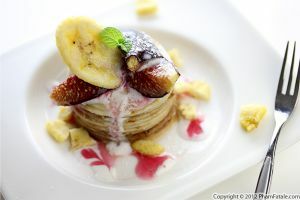 I'll be talking about it for the first time on Chef Bev Lazo's radio show The Coolinary Trends on iRantRadio.com today (June 27th) at 8pm PST. Hope you can join us! 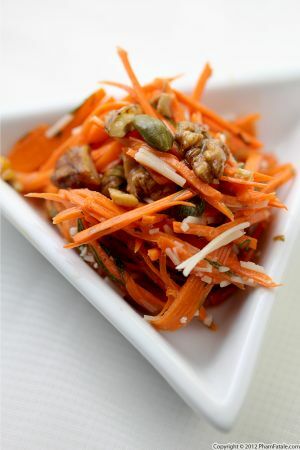 Peel the carrots and shred them using a mandoline or a food processor. If you use the Messermeister tool (see tips), you'll get long threads of carrot. Cut them into about 3-inch pieces. 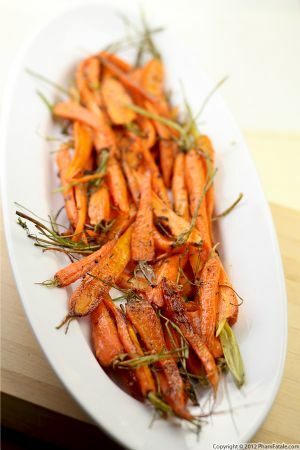 Place the carrots and chopped chile (if using) in a large bowl. Sprinkle with sugar. Drizzle with the juice of 1 lime. Toss well. Chill in the refrigerator and let sit for at least 15 minutes. 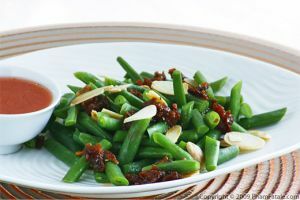 Wash the green beans. Blanch them for about 3 minutes in boiling salted water and transfer to an ice bath. Stir well, then immediately drain the water and pat dry on a paper towel. Trim the ends of the beans. Cut the beans on the bias into 1½-inch long pieces. Add them to the carrots. When you're ready to serve, add the remaining lime juice, parsley and olive oil and mix well. Season with salt and pepper. Toss one more time and sprinkle with the pine nuts. 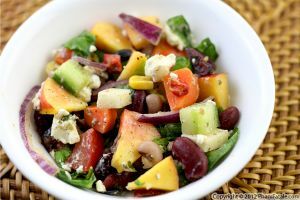 Transfer into serving plates, leaving as much dressing as possible in the bowl, so the salad isn't too watery. 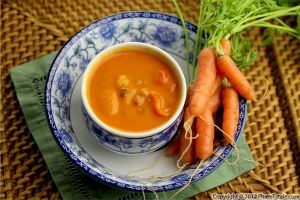 Authentic carottes rapées is the same recipe except without the chile and the other frivolous accompaniments such as pine nuts. 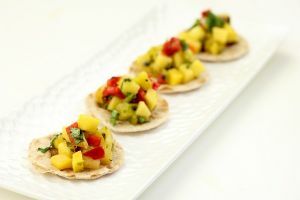 For this recipe, I used a mandoline (with a stopper that comes in quite handy and prevents getting cut!) for faster execution. But I can't praise tthe Messermeister tool enough. I think it's the best utensil for shredding carrots fast if you're doing small portions. Published By: Jacqueline Pham on June 27, 2013.